With over 74% of homes, laminate flooring is the most popular floor to exist. Over the colder months of the year, homeowners search for underfloor heating for laminate floors. 1 Is laminate flooring suitable for underfloor heating? 2 What type of underlay for underfloor heating for laminate? Yes, most laminates are suitable with underfloor heating (electric and water), but it is advisable to check with the flooring manufacturer before installing the system. Some flooring manufacturers recommend to not exceed 27 °C or 80.6°F. Using a radiant heat thermostat restricts the system from reaching the maximum temperature. It should also include a flooring sensor which sends signals to the thermostat control. Different types of laminate flooring have different thermal properties, as such there are differences in their suitability for use with an underfloor heating system. The more dense and the thinner the boards are, the better they conduct heat and typically more suitable they are for use with underfloor heating. When choosing laminate or wood flooring, it is important to ensure good thermal conductivity, which is best when using more dense wood. The thinner the flooring material and the higher the density, the shorter the heat-up time and more responsive the system will be. What type of underlay for underfloor heating for laminate? When you have underfloor heating for laminate flooring, you can use any underlayment. Essentially, the underlay keeps the heat resistance within the allowed tolerances. Using the correct underlay can stop rising damp or condensation, and will reduce the risk of open joints during the heating period. Some radiant heat systems require a membrane (not needing an underlayment) during installation which will increase the height of the floor. 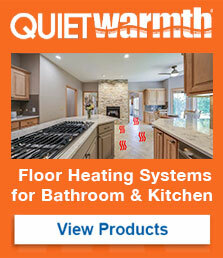 If you are looking at underlayment that has sound deadening benefits with radiant heat capability, QuietWalk is a recommended underlayment in the flooring industry. At 2.5 mm thick, this will allow the height for the electric heat wiring to channel and not increase your flooring height. If you use a thinner underlayment, the subfloor will have to be notched to accommodate the wiring.